Heidi Vratil began her career 22 years ago teaching in the special education department of Maricopa Unified School District’s middle and high schools. Vratil adapted to the district, so small at the time, and spent her career working to advance the experience of its teachers and students. She quickly ascended to SPED director, the district’s first Human Resources director and then returned to a middle school classroom for a time before eventually taking a position in the district office as a professional development coach. 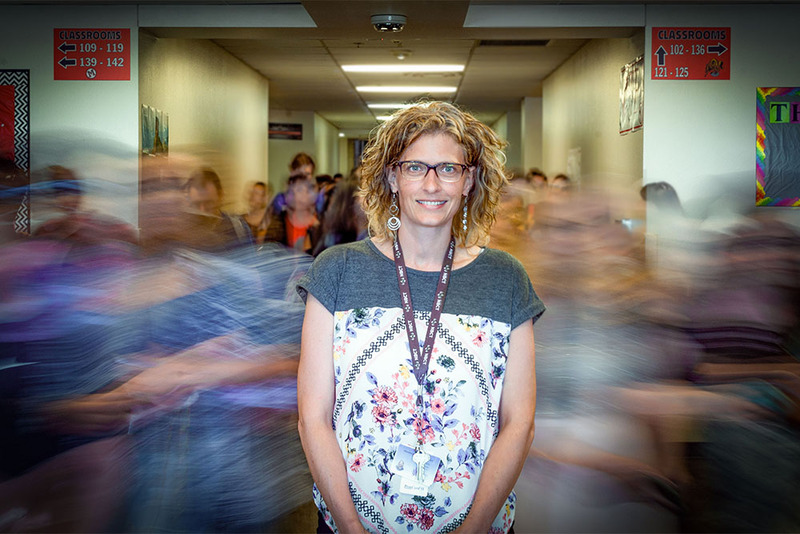 This school year, Vratil has been a Maricopa High School assistant principal. After time spent on leave, she returned with new responsibilities focusing on the school’s activities and facilities. MHS experienced a difficult year in its administrative team, with two resignations causing reshuffling and frustration among staff, students and parents. Next year, the district’s athletic director Brian Winter will take over as principal, and Vratil said the high school administration aims to stay the same by the end of the school year in 2019. 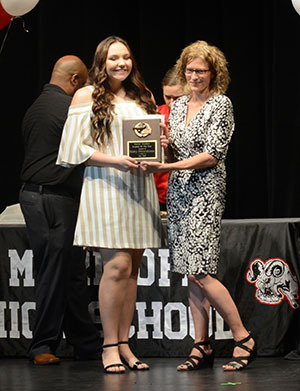 Heidi Vratil (right) presents an award to Haley Petersheim during Senior Awards Night. “The team that we have in place has the skills, the dispositions, the beliefs to grow this place to be a ‘B’ school and then to be an ‘A’ school,” Vratil said. Vratil’s tenure at MUSD, in general, is a practice in curiosity and drive. “Her career exemplifies her willingness to learn and to take risks at new things,” said longtime colleague Bernadette Russoniello. Vratil is a National Board-certified teacher and spearheaded an effort to encourage MUSD teachers to tackle the ambitious certification. “Watching teachers grow in their own fields, in their own practice – that’s the best because then their impact on kids is greater and that ultimately is what we’re here for,” Vratil said. Fifty-five district teachers are pursuing board certification under Vratil’s guidance — granting MUSD the highest percentage in that category in the state. Five teachers are now certified at the highest level an educator can achieve, according to Vratil. Vratil compares the process to the rigor of earning a master’s degree. Vratil also brought the teacher-mentoring program to MHS and the district’s two middle schools. Through this initiative, every rookie teacher is assigned a mentor for guidance. Jennifer Miller is one of those mentors. She credits Vratil with having a profound impact on her profession by habitually pushing teachers out of their comfort zones. “…Vratil is one of the most passionate educators I know. She is all about helping teachers be the best versions of themselves,” Miller said. After a tumultuous year at the high school, Vratil said she considered looking outside the district for another opportunity. She decided to stay to nurture the educators growing in their professions. This story appears in the June issue of InMaricopa.